You! Anyone who has signed into IMDb and is in good standing within the IMDb community can now add images to their favorite movie or TV show. 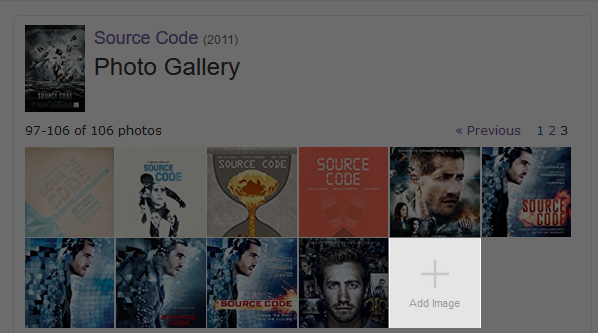 Once selected, you will have the ability to upload images directly to IMDb. As with all other forms of contribution, our staff will evaluate your submission. For titles with no images, on the main title page, where images are typically displayed, the "Add Image" option will be available. If you're using the reference view (the old title page layout), click the "photo gallery" link in the navigation menu on the left side of the title page; once you're in the photo gallery, you should see the "Add Image" option. This feature is currently available on both the IMDb and IMDbPro full and mobile optimized websites. What types of images should I add? Poster - An official poster created by the studio used to promote or advertise the title. Still Frame - A single static image ("frame") taken from the actual film or show. Behind the Scene - A photo taken during filming, containing details such as camera location etc. Event - A photo taken during an activity, party, or event associated with the title. Product/Box Art - Official product artwork such as DVD or Blu-ray covers. Production Art - Additional official artwork such as original storyboards or concept art. For complete details, please see our Image Submission Guidelines. What types of images should I not add? While we want IMDb to be a friendly and enjoyable place, we understand not everyone will agree on the exact definition of an acceptable image. Determination of what constitutes these prohibited items is at the discretion of our editors. Content which falls outside of these guidelines may be edited or removed by our editors without notice. For complete details, please see our Image Submission Guidelines. How do I fix an incorrectly tagged image? If you find an image tagged to the wrong name or title, please select the "Edit Tags" option and correct the association. What if I find an inappropriate image? If you believe you have identified an inappropriate image, please select the "Report This" option and submit the request. How long will it take for my image to appear? We aim to process contributions as quickly as possible, our time to publication changes based on the type of data you are contributing. You can find more details on our processing times page. Can my images be deleted? IMDb reserves the right to delete or withdraw submitted content at any time. In addition to investigating images that have been reported to us as violating our content guidelines, we may remove images at our discretion based on editorial guidance. I added an image to my favorite title, making sure to tag all the actors in the photo. The image appears on the title page but not on the actor's page. Is this correct? Yes, user supplied title images are only visible on title pages. They will not appear on name pages. Adding images to name pages requires an IMDbPro subscription. To learn more, please see Adding photos to IMDb. How do I add a headshot or other images to an IMDb name page? The "Add Image" option is only available on IMDb title pages (i.e. movies, TV shows, TV episodes, video games, etc.). Adding images to name pages requires an IMDbPro membership. To learn more, please see Adding photos to IMDb. How do I change a headshot on an IMDb name page? Changing a headshot on a name page requires an IMDbPro membership. To learn more, please see Adding photos to IMDb. If an image is of a different individual and is incorrectly assigned to a name page then you may report these cases via our contact form by selecting the options IMDb Fan/Contributor questions > Images & video > name page images > remove images and our staff will aim to help out. However please note that any headshot change requests for the correct individual raised for purely stylistic reasons will not be actioned. What image formats, sizes and resolutions are supported? IMDb supports JPEG and PNG images. Images must be no smaller than 50KB and no larger than 20MB. Both the image height and width must be between 500 and 8000 pixels. Based on the dimensions, IMDb may crop the image as necessary. For posters, to minimize cropping, we recommend a vertical alignment (i.e. portrait orientation) with an aspect ratio of 1:0.675. Additionally, while IMDb may accept low resolution images for older content, we recommend always providing the highest quality image available. How do I fix the 'type' of an image? If, for example, you find a poster listed as a 'still frame', you can let us know via our contact form by selecting the options IMDb Fan/Contributor questions > Images & video > Other image/video issues followed by the E-mail button. Our staff will do their best to help you out! I am getting an "Error adding Image" when uploading an image. What should I do? First, check your file. Make sure your image is a JPEG, between 50KB and 20MB, and has an RGB color space. If you are unsure of the image file type, please open you image via an image editor (Photoshop, Illustrator, Corel Draw) and resave as a JPEG. Set the Preset to "Web" which will convert the image to the RGB color space. All images intended for the web should be RGB, images intended for printing may be RGB or CMYK. Second, check your browser. While image upload is supported on all newer browsers, please make sure your browser is completely up to date. If you continue to have issues, please try another browser. IMDb recommends either Firefox or Chrome for image upload. Third, check your internet connection. If you are having trouble uploading very large files (18-20MB), please try compressing your image slightly. If you have an unstable internet connection, a smaller image may help. Please note, the larger your image the better it will display on IMDb, so only compress your image if necessary. Lastly, if you continue to have issues with your browsers or internet connection, if possible try uploading from a different computer at a different location (i.e. your home or work). While unlikely, there may be an internal setting within your computer or network which is interfering with the upload process. No, all images must be uploaded to IMDb. This ensures your image is always available. Who owns the images I add? The rights owner of the image continues to own the image. By uploading your image, you agree to the IMDb Conditions of Use, which grants IMDb rights to display and use image content. The "Add Image" option is only available on IMDb title pages (i.e. movies, TV shows, TV episodes, video games, etc.). Adding images to name pages requires an IMDbPro subscription. To learn more, please see Adding photos to IMDb. Yes, user supplied title images are only visible on title pages. They will not appear on name pages. Adding images to name pages requires an IMDbPro membership. To learn more, please see Adding photos to IMDb. I used to upload images via Poster Services. Has free user images replaced the paid poster services product? Yes, IMDb no longer charges for title images. With Poster Services, after paying for an image, I used to be able to designate the primary image. Is this option still available? Yes. Please see our submission guide for how to do this. As a production/distribution company, how do I add/update posters and images for all of my titles? In addition to title images, IMDb provides additional services to its industry partners. As a production or distribution company, IMDb Scorecard allows its partners the ability to review and update the titles they represent on IMDb. For more information please see the IMDb Scorecard help page for details. Can I upload images for any title? We do not allow images to be uploaded to adult titles. I use the IMDb reference view, I can see how to add images for titles with existing images, but I don't see the "Add Image" option for titles with no images? Is there something wrong? At this time, the "Add Image" option is not available for titles without an image via the reference view. To add an image via reference view you can modify the URL by replacing the text "reference" with "mediaindex". For example: http://www.imdb.com/title/tt0068646/ reference would be replaced with http://www.imdb.com/title/tt0068646/mediaindex. We apologize for this workaround. Does adding images impact my contributor ranking? Yes, new images and all related image submissions count towards your overall contributor ranking. Can I upload images to in-development titles? An IMDbPro membership is required to add images to titles which are still in development. The 'Add image' button will not display on in-development titles for those without a membership.